This event is catered with finger foods and drinks. Unlike our past events, this one focuses more on close interactions among speakers and audience, in a salon style. Tickets ($15 each) can be bought directly on Eventbrite. Speaker: Li Long - QLD Region Partner @ RoyalPay. Working with some of the largest companies in China, RoyalPay has established strong connections with Tencent, Alibaba, China Telecom and JD. The company partnered with WeChat, AliPay and Bestpay to offer their mobile payment services to Australian businesses. Li is a highly experienced WeChat expert who have assisted many Australian brands in Brisbane with their WeChat presence. Speaker: Lindsey Sun, Managing Director @ Meow Media. 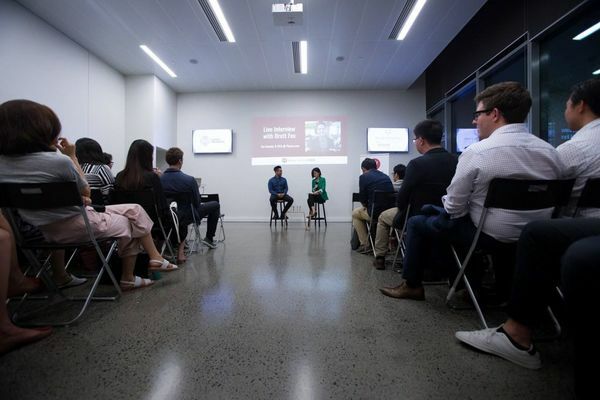 Lindsey founded Meow Media in 2016, after identifying a clear gap in cross-culture marketing sophistication between Australian and Chinese businesses. She had extensive experience in the corporate, nonprofit and SME sectors, and was awarded the '30 under 30' title by the Australian Institute of Management. We welcome all entrepreneurs and business professionals to join us！Attendees at the Chinese & Australian Business Leaders (CABL) events are warm, positive, career-driven and love to meet new people. 8pm-8.10pm Business card draws - amazing prize line-up! Please note that entrance to the venue will be closed at 7pm. Meow Media (妙傳媒) provides digital marketing solutions for businesses and nonprofit organisations in Australia. We are committed to empowering entrepreneurs through digital technology, events and partnerships. We have an amazing prize line-up for this event! If you want to be a lucky winner, make sure you stay until the end of the guest interview for your chance to win our business card draws! Harmonie Music Centre, Brisbane's leading music education and therapy, has provided tickets to the world-renowned pianist Yundi Li's concert on 28 Oct. Thank you Vian@Harmonie! Di Vine Hair, the award-winning hair salon located in Brisbane CBD, has provided complimentary formal hair styling services as prizes. Thank you Candice@Di Vine Hair! Kingsfood Sunnybank, Brisbane's highly popular Chinese restaurant has graciously provided meal vouchers as prizes. Thank you Robin @Kingsfood! SunPAC, Brisbane's world class performing arts centre located in Sunnybank, has provided vouchers to their amazing shows. Thank you Jessie@SunPAC! Many thanks goes to Fishburners who have provided the space for our event! It's Australia's largest community for tech start-ups and a not-for-profit organisation. A big thank-you to Pixel Studio for supporting us with photo shooting and video production of our event! It's a full-service video production company providing quality video content across a diverse range of business sectors. Our gratitude goes to the experts at the Di Vine Hair Brisbane, who will create the hairstyle for our event host and speaker at this event. Di Vine Hair is an awarding-winning hair salon based in Brisbane CBD. Thank you Candice@Di Vine Hair! Please note that this event produces photos and videos which will be published on social media following the event. If you do not wish to appear in these material, please advise us at the event.